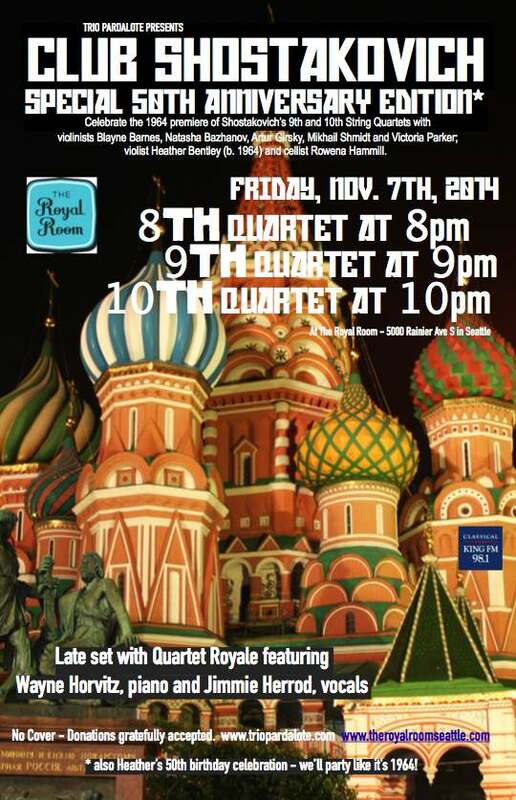 Join us for a historic recreation of the premiere of Shostakovich’s 9th and 10th Quartets on Friday, Nov. 7th at the Royal Room. It’s also Heather’s 50th birthday! 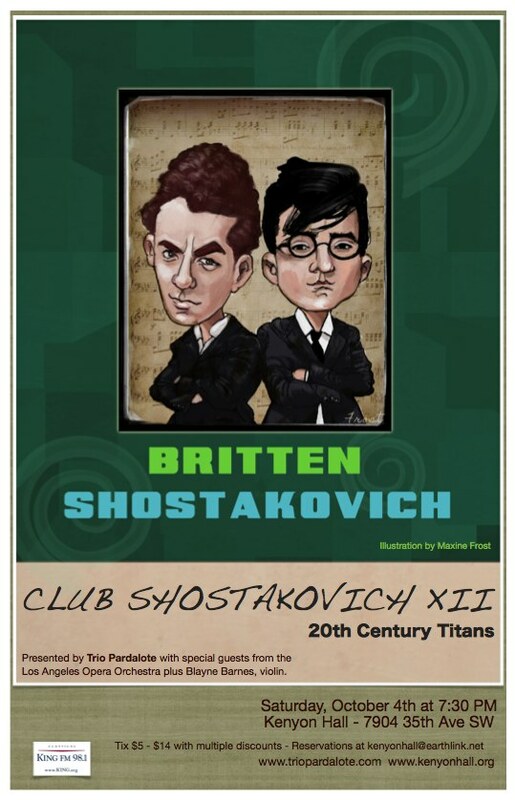 CLUB SHOSTAKOVICH XII – 20th Century Titans. We return to our beloved Kenyon Hall for a celebration of two magnificent composers: Benjamin Britten and Dmitri Shostakovich, of course. Friends from the LA Opera Orchestra join us for Britten’s 1st Quartet, a cello trio rounds out the program with Three Fantasias of Purcell and our dear friend, violinist Blayne Barnes, joins Trio Pardalote for Shostakovich’s 12th String Quartet. Reservations encouraged: kenyonhall@earthlink.net Tix are $5 – $14 with multiple discounts. 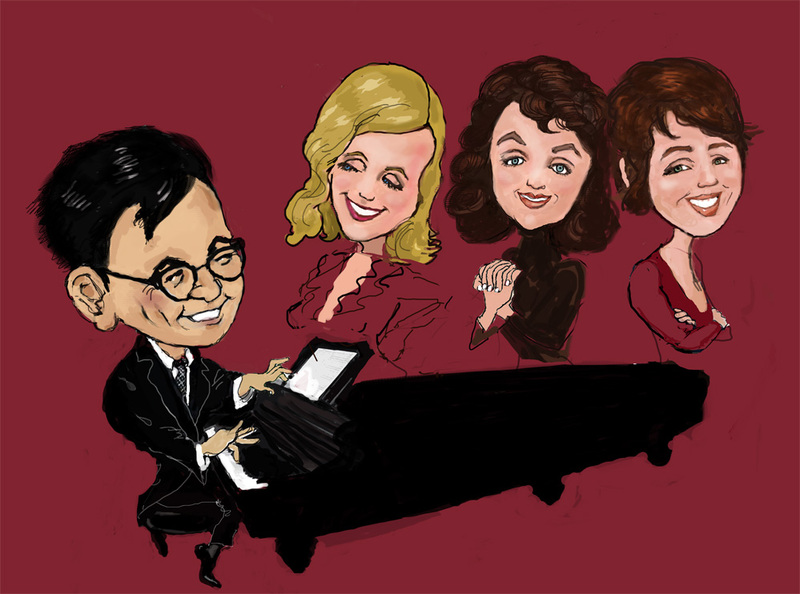 Britten and Shostakovich go toe to toe vying for 20th Century Quartet championship title. 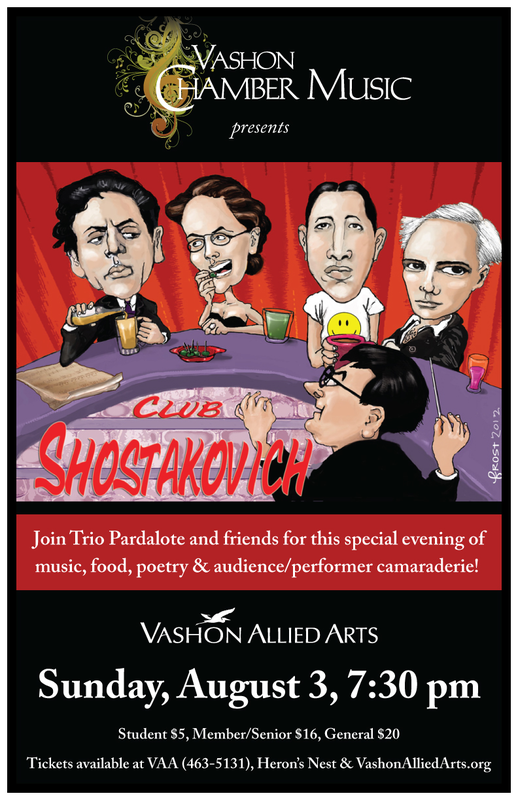 Hosted by Vashon Allied Arts on beautiful Vashon Island. Shostakovich’s Tenth Quartet (1964) bears a dedication to Mieczyslaw Weinberg, the Jewish/Polish composer who fled to the Soviet Union after his family members were murdered in the camps. We’ll play the Lento from Weinberg’s Fourth Quartet (1945), as well as Gideon Klein’s String Trio from 1944 and Alexander von Zemlinsky’s A Major Quartet from 1896. Blayne Barnes, Natasha Bazhanov and Artur Girsky, violinists extraordinaires, join us. Tickets are $20/general – $10/student/senior/needs a discount. Available at the door (cash only) or in advance at http://www.brownpapertickets.com/event/612874 with no service fee! Trio Pardalote curates a chamber music series showcasing works from the 20th century and beyond in unique, relaxed settings. We have reached the halfway point in the cycle of string quartets by Shostakovich. 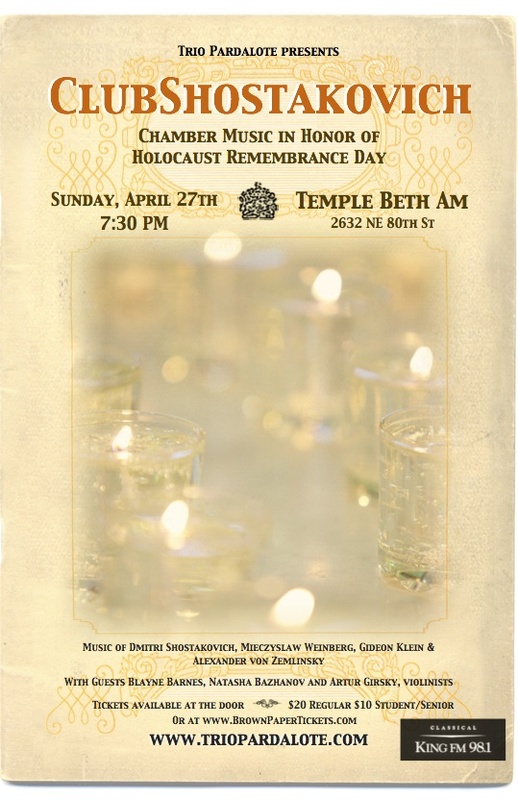 Join us for a night of musical reflection, meditation, and expression. 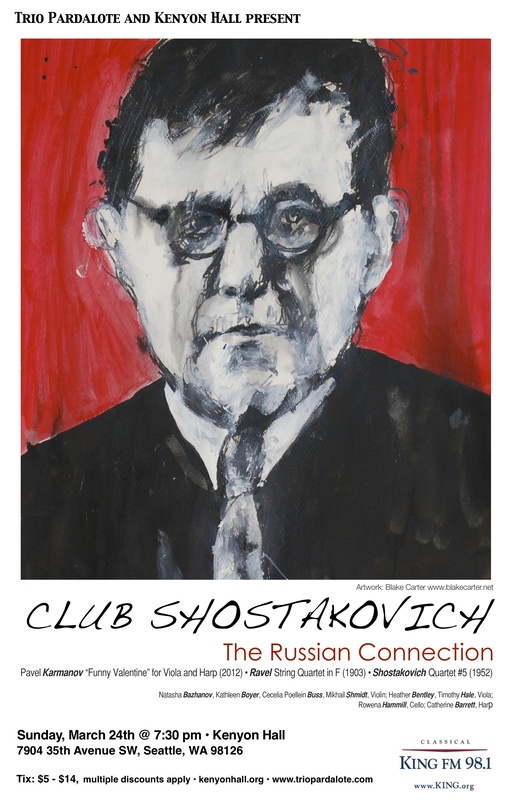 Join us for CLUB SHOSTAKOVICH VI at Kenyon Hall. Our super line-up of collaborators includes violinists Artur Girsky, Natasha Bazhanov, Karin Choo, Kimberly Houglum and Eugene Bazhanov; violist Timothy Betts of the Kairos Quartet, and cellist Douglas Davis, as well as flutist extraordinaire Paul Taub. We’ll start with flute quintets by Arthur Foote and Alberto Ginastera, make our way to the fascinating Shostakovich Sixth String Quartet and finish up the season with the always rousing Mendelssohn Octet. March 24th program: Shostakovich String Quartet No. 5; Ravel String Quartet; “Funny Valentine” for viola and harp by Pavel Karmanov. Guest artists include violinists Mikhail Shmidt, Natasha Bazhanov, Cecilia Poellein-Buss, Kathleen Boyer, violist Tim Hale, harpist Catherine Barrett. Sunday, January 20th, 7:30 PM @ The Q Cafe. Guest artists: Artur Girsky, Natasha Bazhanov- violin, Julie Whitton- viola. 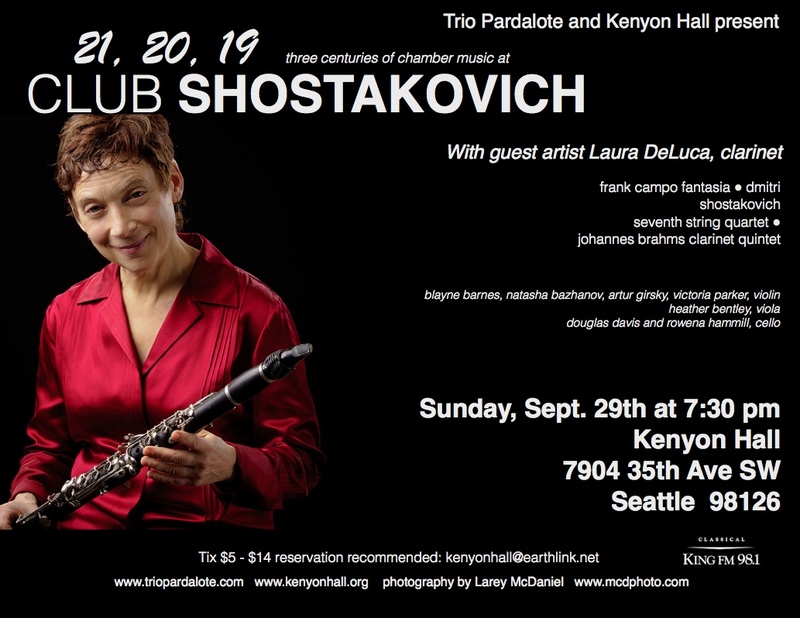 October 28th program: Shostakovich String Quartet No. 3, Dvorak A major piano quintet, Rossini Duo for Cello and Bass, “Memo” for solo violin and tape recorder by Michel van der Aa. Featuring Elisa Barston, Mikhail Shmidt, Ron Patterson and Karin Choo- violin, Roxana Patterson- viola, Douglas Davis- cello, Travis Gore- bass, Jessica Choe- piano, with Trio Pardalote. August 22nd program: Bartok Duos for Two Violins, Shostakovich String Quartet No. 2 and Brahms String Quintet, op.111. NO COVER, but donations greatly appreciated to help cover our costs. Guest artists include violinists Natasha Bazhanov, Artur Girsky, violist Julie Whitton plus violinists Lara Lewison and Madeline Menard. The Q Cafe features comfy seating and delicious treats and coffee drinks available for purchase at the counter. Come join us as we celebrate the music of three great composers in a homey environment – ALL AGES!! Join us for the first event on Sunday, July 8th @ 7:30 PM. The Royal Room – 5000 Rainier Ave. South, Seattle 98118. 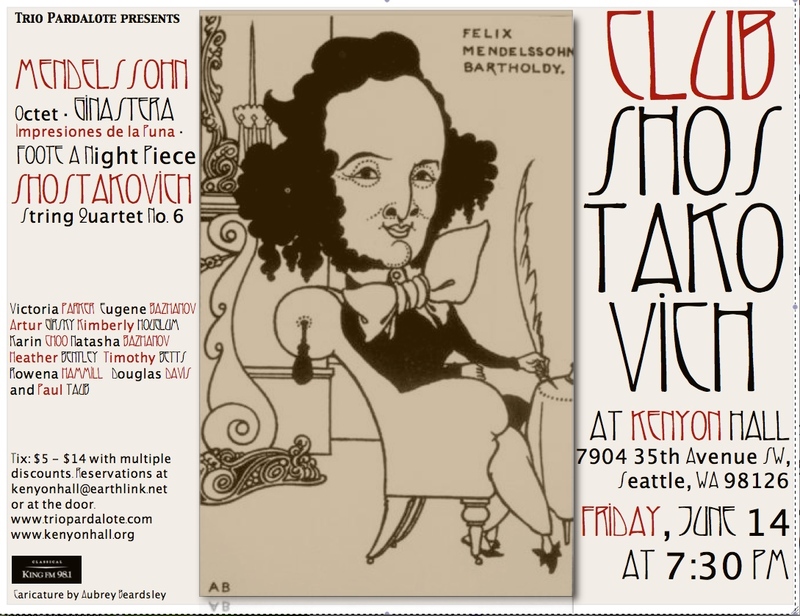 July 8th program: Shostakovich 3 Violin Duets, Jean Cras String Trio, Andante from Mozart’s Divertimento in E Flat Major, and Shostakovich String Quartet No. 1. Trio Pardalote with Artur Girsky, Natasha Bazhanov (violin), Julie Whitton (viola) and new poetry from Seattle poet Monica Schley. As musicians, we feel a deep kinship with composers who may no longer walk the earth. We count Dmitri Shostakovich as one of our dearest friends, though we weren’t blessed with a personal introduction. Between a discomfiting relationship with the Stalin regime and other pressures of 20th century Soviet life, we imagine Dmitri never had a chance to relax in the salon-like environment that Schubert and his contemporaries enjoyed, so we’d like to dedicate our new music/art/verse offerings to him, wherever he may be. 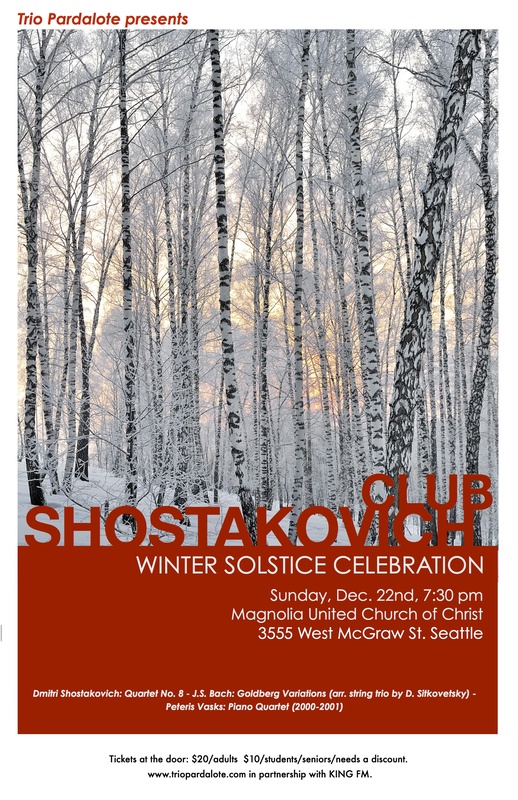 Come lift a glass to our Russian friend at Club Shostakovich where our Seattle musical community will thrill you with cherished chamber works of the 20th century and beyond (both directions! ); local poets will read from their own oeuvre as well as classic favorites; and visual artist friends will reveal creations inspired by the programming. 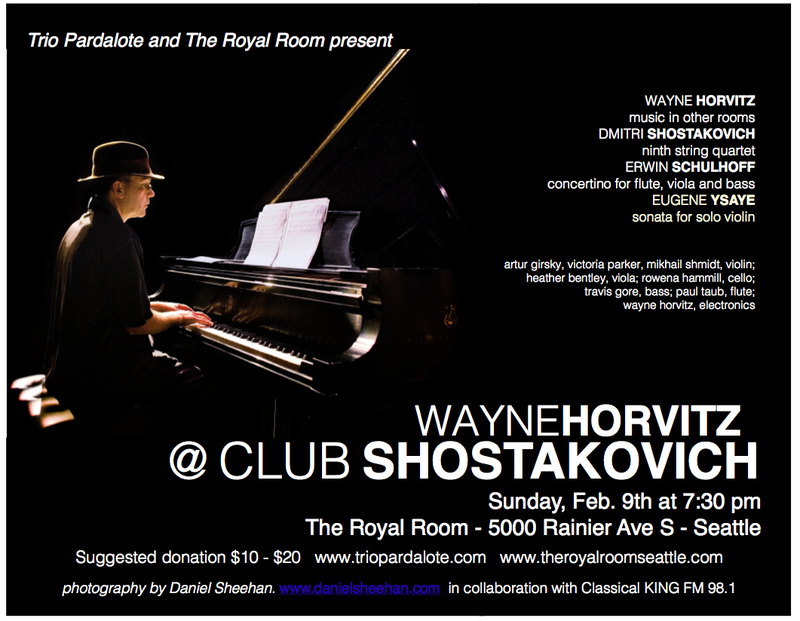 Hosted by the Royal Room, Seattle’s brand-new music venue, Club Shostakovich offers you a chance to sit at the bar, join your friends at a table or relax on the banquettes while noshing on yummy yam chips or a splendid pork chop. Located in the heart of Columbia City, the Royal Room is the brainchild of Seattle composer extraordinaire Wayne Horvitz, who realized if the Emerald City was ever going to have the pitch perfect combo of great listening space and great hang-out space, he’d have to build it himself. And he has. With partners Tia and Steve, Wayne has created a beautiful acoustic with a lovely Steinway piano and all the comforts of home for us musicians. Come visit us at Club Shostakovich!